Among the first mythical creatures to go extinct when the early rays of the Enlightenment began to filter through the blinds of superstitious antiquity, were demons. It was recognized that the activities attributed to demonic possession closely resembled epilepsy and psychological illness and that Occam’s Razor would remove any unseen entities with its no-nonsense straight-edge in one deft pass. And yet they remain. Among the ghost hunting crowd, demons have been recategorized from fallen angels to entities that have never been human. Their reality is assumed, and results of investigations, not surprisingly, support that assumption. It was, however, a Dirt Devil advertisement that created a desire to watch The Exorcist now when darkness comes early and the leaves have fallen from the naked branches and a chill has permeated the air. As I watched the still disturbing film, I realized that I had also watched the Exorcism of Emily Rose and The Last Exorcism within the past few months as well. I am no fan of demon movies; even with no demonic forces out there, inevitably young women are tormented by what ultimately turns out to be a male establishment. My threshold for watching the suffering of others, even if only acted, is minimal. Movie makers—and often horror writers—know and exploit this, bringing us to face the real demons, the shadowy regions of our own minds. 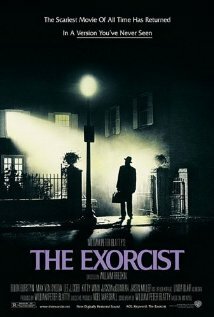 The Exorcist is particularly effective in this since it is Fr. Karras’s demon that ultimately wins out. Having never read the novel, I’m not sure whose idea it was to make the demon Pazuzu, but once again the origins of demons does not fit modern media’s expectations. Pazuzu was a Mesopotamian “demon.” Akkadian doesn’t have a proper word for what the Judeo-Christian tradition would introduce as a fallen angel. Demons were simply a way of explaining profound misfortunes such as droughts, pestilence, or the Bush administration. Eventually such misfortunes became personified and took on the ability to possess a human being. Here is where psychology and neurology have come to banish demons. Part of the terror of The Exorcist is that such scientific explanations are laid flat in the face of real supernatural power. The lessons of over-consumerism, as evidenced in Black Friday eclipsing Thanksgiving for many (the lines were formed in many locations well before midnight, cutting into family time in order to get first crack at the bargains) show the demon more clearly. Holidays are measured in importance by the amount of money spent. Perhaps it is no wonder that Halloween’s demons have lingered through November and even to the end of the year. This entry was posted in Current Events, Feminism, Holidays, Mesopotamia, Monsters, Movies, Popular Culture, Posts and tagged Black Friday, demons, Dirt Devil, Enlighten, Exorcism of Emily Rose, Mesopotamians, Pazuzu, The Exorcist, The Last Exorcism by Steve Wiggins. Bookmark the permalink. Indeed, the more they push this Black Friday thing, the more disappointing the end of the year becomes. I try not to let it get to me, but culture seems saturated with this mindless desire for good deals that aren’t even good, or deals. It’s such a distraction from what is really important.